Le peuple du mur #6 forms part of Paris-based Mame-Diarra Niang's solo exhibition At The Wall at Stevenson, Cape Town (18 September - 31 October 2014). 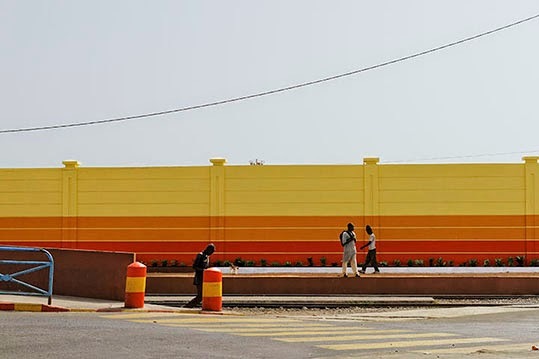 The At The Wall series came to life as the French-Ivorian-Senegalese photographer drove through Dakar. From a moving taxi, Niang took pictures of rather empty spaces rather than focusing on the hustle and bustle of city life. Walls take centre stage and people only appear in some photographs. Like a pilgrim, Niang appears to be searching for answers in a place that forms part of her heritage but is far from being her hometown.